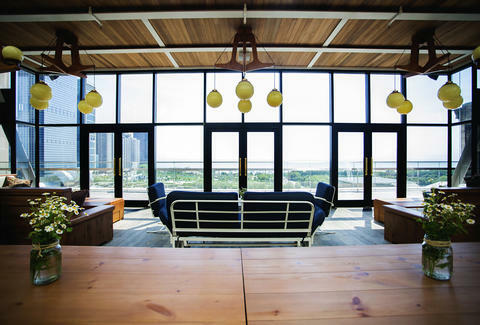 Sure, the Loop isn't exactly known for its bustling nightlife, but a newly opened landmark hotel may sway you to party near Millennium Park by means of an epic game room and restaurant run by the folks behind Longman & Eagle, a patio-equipped Shake Shack, and a rooftop bar with an impeccable view. 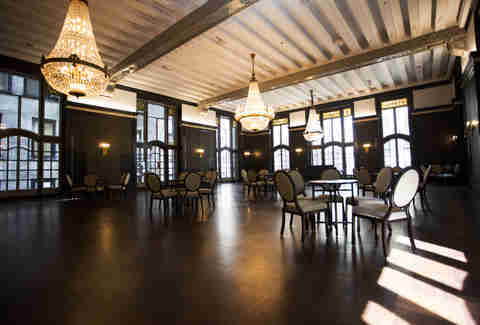 Having survived the World's Fair, Prohibition, and more bad Cubs seasons than any human could tolerate, the 125-year-old Chicago Athletic Association Hotel is a hub of history that's now open to the public for first time. Check out this primer on everything you'll want to explore. 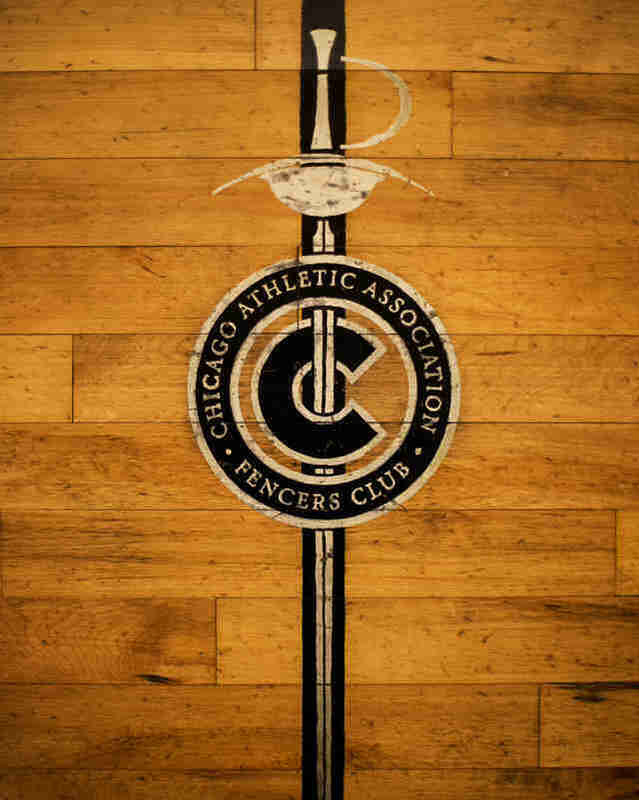 The CAA was founded in 1890 by Chicago's elite (including Marshall Field, Cyrus McCormick, and A. G. Spalding) as a men's club for athletic, business, and social activities. The hotel building, designed to look like a Venetian palace, was constructed in time for the World’s Columbian Exposition (thankfully not for the intended purpose of murder). 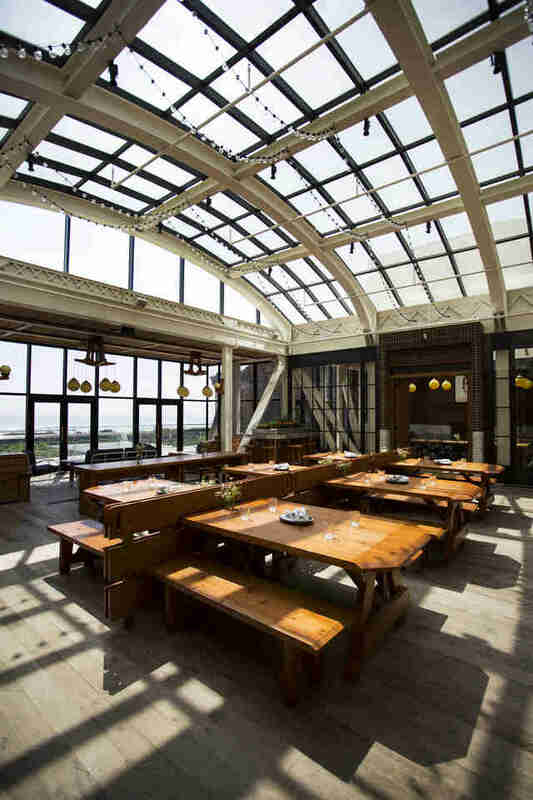 Closed since 2007, the hotel was revived by local mogul and history buff John Pritzker, who revamped while preserving its landmark feel, as seen in architectural details like swaths of old fencing courts lining the walls of the hotel elevators. 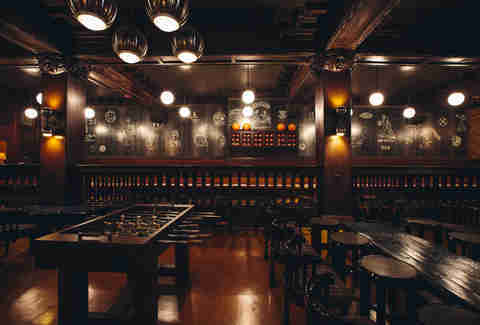 Accessible through the lobby or private alleyway entrance, the hotel's fully restored game room sports tabletop games, 300 seats, and a dim, lacquered whiskey bar mystique. 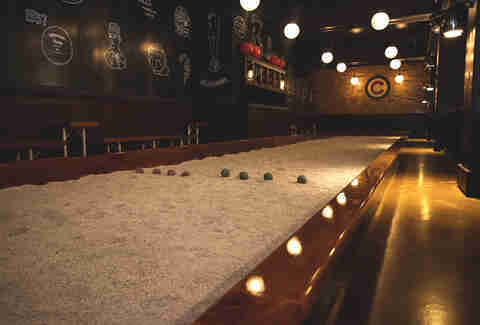 Play pool, shuffleboard, or foosball while working on a local craft beer (Half Acre, Revolution, Off Color) or, once you've sworn you play better after a few drinks, a pitcher of Schlitz. Consult the resident Games Master (oh yes, there's a Games Master) to brush up on your bocce rules before hitting the indoor court padded with crushed oyster shells. Along with illustrations denoting great moments in Chicago sports, one of your friends is liable to ask, "hey, isn't that the Cubs logo hanging on the back wall?" To which you'll reply, "it is, but the symbol originally belonged to the club before letting member William Wrigley use it when he bought the Cubs." Then they'll ask, "how'd you know that?" You'll say, "I read about it in Thrillist." Then you'll both share a good, long laugh, together. 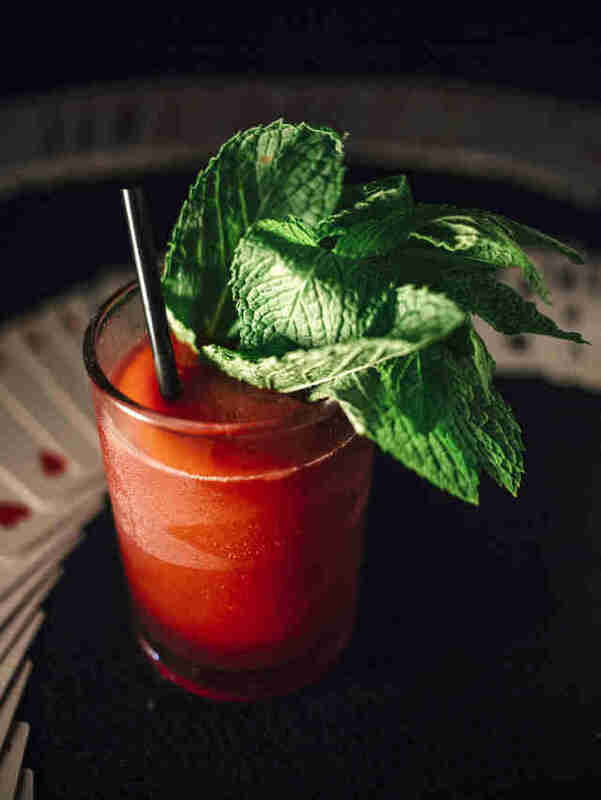 The cocktail menu comes from local Tiki master Paul McGee (of Lost Lake and previously Three Dots and a Dash) and includes a wheel of classic drinks with seasonal variations promising to always keep slots for a daiquiri, Old Fashioned, Pimm's Cup, highball, etc. 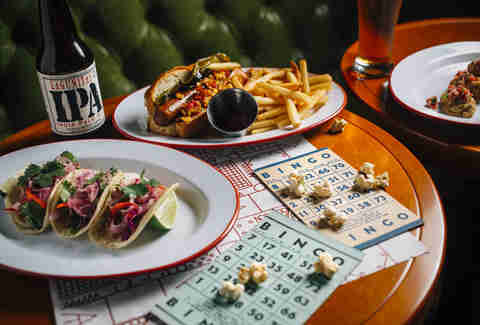 The Game Room's food menu runs the gamut of concessions-style eats including fried pickles on a stick with smoked tomato aioli, duck sausage corn dogs, and root beer floats that can be spiked with fernet. 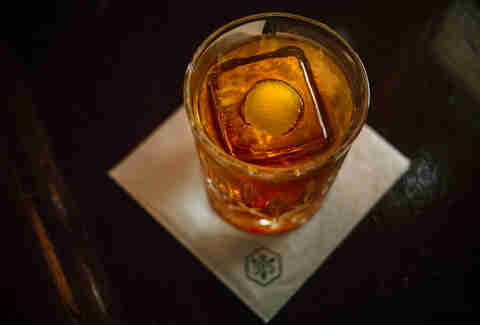 In the entryway to Game Room sits an eight-seat micro-bar called Milk Room inspired by the hotel's original Prohibition-era speakeasy (not because it's a psychotropic Clockwork Orange milk den). By day there will be donuts, pastries, coffee, and tea from Rare Tea Cellar. By night there are cocktail selections centered around rare spirits, if you've got a hankering for sugar cane or pre-embargo Cuban rum, you've found the right place. 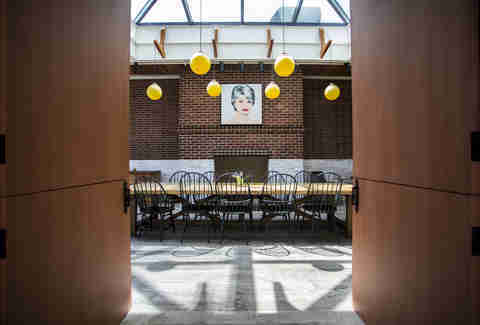 Cherry Circle Room, under the care of Executive Chef Peter Coenen (Boka, The Gage), compiled its menu based on the food options found on the Athletic Association's original restaurant menus from the 1890s dug up at the New York Public Library. Serving from a butcher block cart, a roasted leg of lamb or prime rib can be carved for you tableside. Daytime offerings include beef and duck hash for brunch and a triple beef burger topped with smoked Gouda, caramelized onions, and bread & butter pickles for lunch. 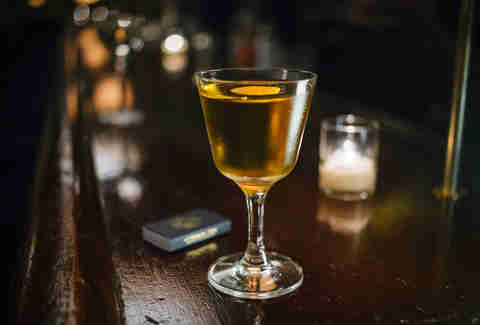 Cocktails are also available via roving cart, including century-old recipes for Manhattans and martinis as well as after-dinner amaro. Drinking is just more natural when you're inside a city landmark. 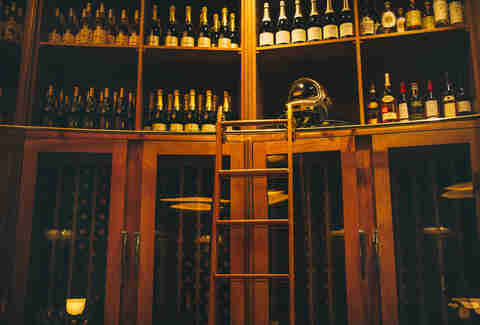 The restored cherry wood cabinets curving around the bar house the wine selection from sommelier Andrew Algren (Alinea) and any stray astronaut helmets. 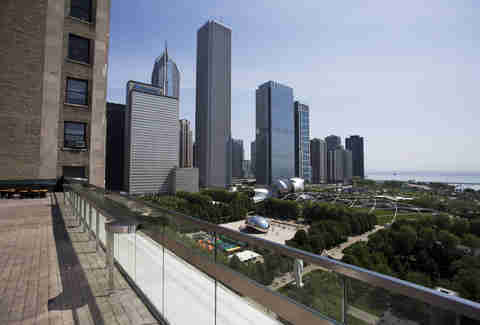 The peak of the Michigan Avenue side of the hotel houses a skylit restaurant and rooftop deck at Cindy's. The light, airy atmosphere serves as a counterbalance to the dark decor of the Game Room. Gather around spacious picnic tables for a spread of shareable plates of burrata and crudo or a giant pot of frogmore stew (shrimp, king crab claws, Publican Quality Meats andouille, corn, and potatoes). 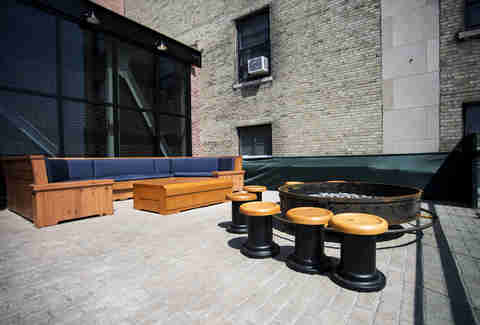 The outdoor patio equipped with dual fire pits, stools, and cushy furniture will afford you a view of Millennium Park. See! Enjoy watching tourists as they ogle at themselves in The Bean for 20 minutes and then realize they have no idea what to do in the city. 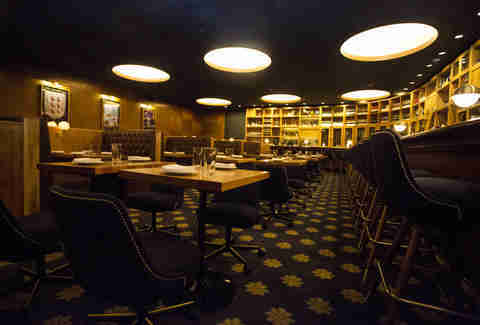 In addition to seating for 150 in the main dining room, there's also a 20-seat private dining room for parties. 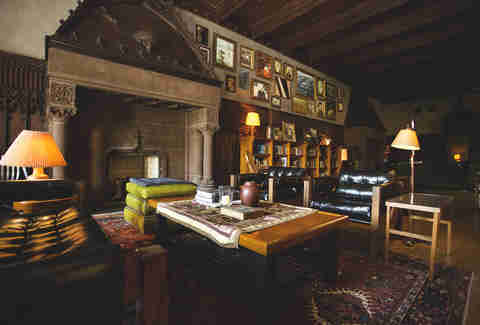 The lobby of the boutique hotel has plenty of vintage touches and provides leather seats and free Wi-Fi to give you more humanity than any coffee shop ever could. 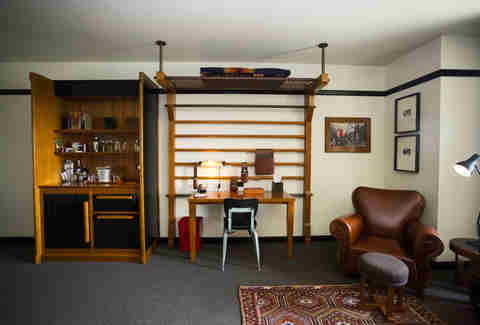 Whether you've planned a proper staycation or are just too full to go home, there are 240 rooms in the hotel (starting at around $350 a night) that incorporate athletic touches from the old men's club like shelving that was once a climbing rack for some guy who's now old and probably still really buff. 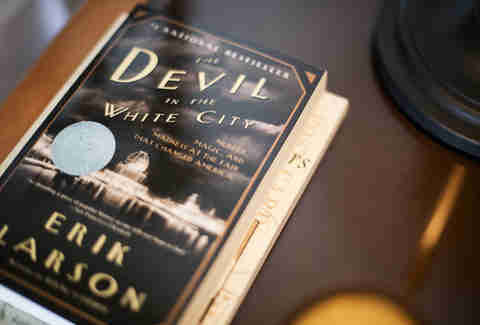 Rooms also come with key reading material, Devil in the White City, which beats the hell out of your average hotel's copy of the Gideons Bible. On the eighth floor, you'll find a pair of ball rooms with marble flooring, wood carvings, stained glass, fireplaces, and stalactite ceilings -- all the opulent essentials. As if indoor bocce or the rooftop view weren't enough to draw you out already, how about adding one of the best fast-food options in the city? 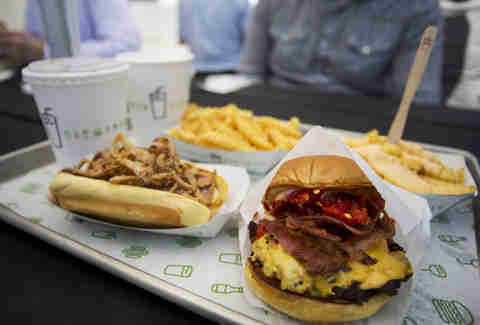 Chicago's second installment of Shake Shack -- joining the bustling River North location -- will offer the same great flat-top burgers and dogs made only greater when topped with beer-marinated shallots. 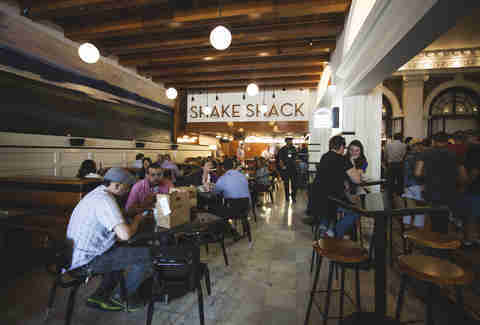 Being housed inside a landmark, the design and setup looks different from other Shacks. Patio seating is present with four picnic tables sitting right on Michigan Avenue so passerbys can instantly come down with lunch envy. Don't leave without sampling one of the locally collaborated concretes. 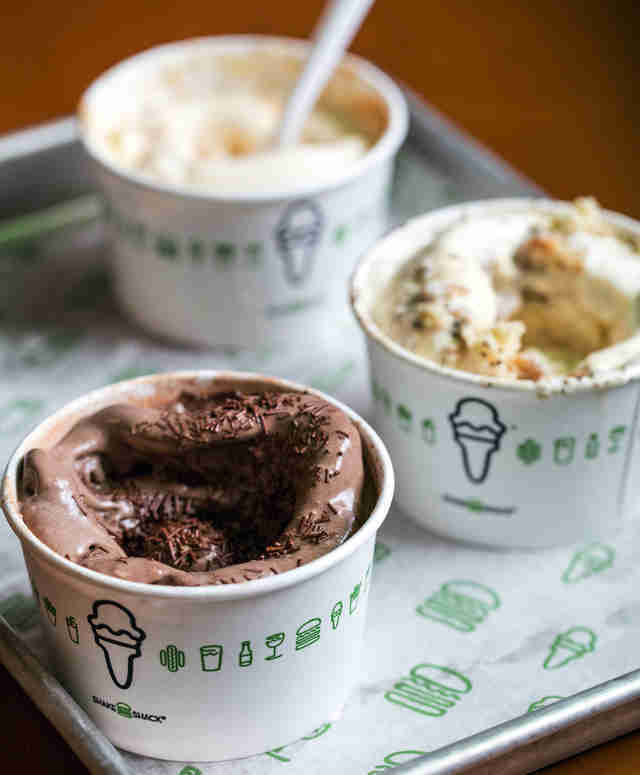 The new custard offerings include the Millennium Perk (Intelligentsia coffee beans, marshmallow sauce, and a Glazed & Infused old-fashioned donut), the Bang Bang Pie Oh My made with a slice of Bang Bang's banana cream pie, and the Penthouse Sweet featuring Vosges pecan-walnut caramel toffee. Sean Cooley is Thrillist's senior editor and he'll need a few practice throws before throwing down in bocce. Follow him: @SeanCooley.